Wildlife TV presenters Martin Hughes-Games and Iolo Williams have teamed up for an amusing and informative show packed with facts and fun for the whole family. Extremely wild about wildlife these two brilliant and entertaining enthusiasts will take the audience on a funny and fascinating journey. The journey begins with stories from their childhood when their love of nature and wildlife was just natural: Martin’s love of chickens and Iolo’s connection with fish and a compulsive desire to skip school, preferring to be out in the wild. The journey continues with stories of the occurrences and life events that lead them to where they are today, including Martin’s experience as a producer/director (there’s plenty of tales to tell here) and Iolo’s experience working with the RSPB catching egg thieves and working with the army. The tales of their journeys continue to where they are today: well known and passionate wildlife TV presenters working with the BBC to educate and inspire its audience to connect with and care for the natural world. Here the audience can take a look behind the scenes of wildlife TV presenting and some of the interesting things it entails. Along their journey they are assisted by a very well known VIRTUAL wildlife expert, popping up at just the right moment to make sure the facts are correct. He makes an exciting, funny and very informative addition to the show. You can be sure it won’t be boring and nobody will fall asleep as the show involves audience participation, plus there is a wildlife ‘agony aunt’ to answer any wildlife questions the audience may have. All in all this is a funny, informative and very wild show! Martin Hughes-Games trained as a zoologist before joining the BBC science department as a researcher and moved on to film production. He has worked in television of 30 years and presented film and live television for BBC1 and BBC2. He is passionate about wildlife and is also an active conservationist. He was a member of the Springwatch production and presenting team from 2006 until 2018. 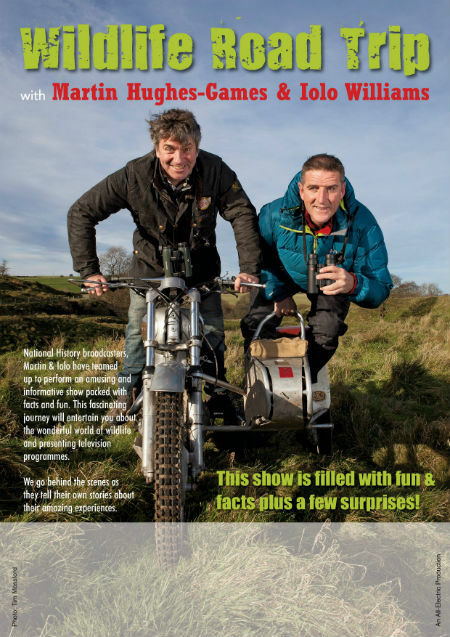 Martin Hughes-Games and Iolo Williams are touring together with their Wildlife Road Trip from 2016, bringing their experiences of the world of wildlife TV presenting to the audiences along with many interesting and unusual wildlife facts.